There’s a small army of activities to participate in when you’re in Belize, some of our other posts can give you detailed guides of the wheres and how-tos of Belize’s most premiere destinations. Today, however, we’d like to bring you a few of the less known wonders that deserve just as much attention as the likes of Big Rock Falls and Victoria Peak. This is Victoria Peak’s direct western counterpart and the actual highest peak in Belize scraping past the aforementioned by just 4 meters (12 feet is an entire floor level anyway). Doyle’s name was coined in 1989 after Sir Arthur Conan Doyle’s book The Lost world, reportedly due to the quote “there must be something wild and wonderful in a country such as this, and we’re the men to find it out!” that appears in it – quite fitting indeed. 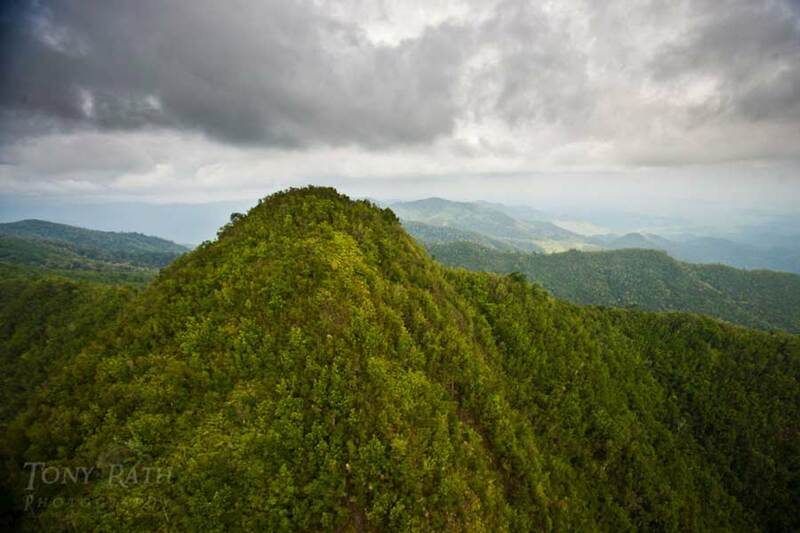 The highest point of this mountain may not seem “as high” simply because it doesn’t boast a dramatic peak like Victoria’s, but on a clear day, you can see the summit from the shore down in Dangriga. There have only been two climbing expeditions, in 2007 and 2008 both of which took 8 days of climbing and hiking, proving just how intense 1,124 meters can be through virgin jungles. This one is an extreme Bear Grylls level expedition which certainly deserves more attention. Not all great things have great beginnings, the Vaca project was/is a large scale Hydro-electric dam construction project on Belize’s Macal River, the river that already houses two other Hydropower dams. Vaca was met with much resistance by locals at first, but the project still went on as planned. Following the construction and commissioning of the new dam, the floodgates were shut and the reservoir began to fill. Vaca lake was born and today is a long stretch of filled river which unintentionally created beautiful swimming waters and created access to newly river-bank accessible waterfalls. 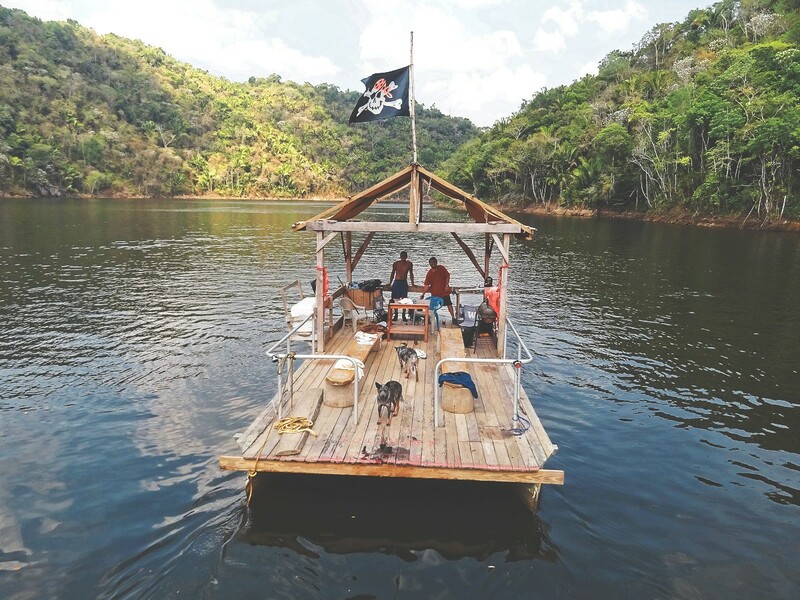 There is now a small tour company operating day long pontoon rides up and down the lake which allows people to swim at different choice spots, bathe under the waterfall and to have lunch in or near the waters as they float along. If ever man had involuntarily made something beautiful, this would be one such case. The Cockscomb Basin Wildlife Sanctuary, unlike Vaca Lake, had nothing do to with people – we simply found a pristine eco-system and realized it was worth preserving! Cockscomb basin is home to many of Belize’s wildest and must elusive species, most famously of which are our very own Panthera onca (jaguar for short). Cockscomb is also the only protected jaguar habitat in the world! There’s a lot more to see and do in Cockscomb Basin than look for a jaguar, whom chances are you wouldn’t find. The other main draw is Victoria peak which avid adventurers trek out to climb, Additionally, there are networks of forest trails, fresh water streams, waterfalls, and animal sighting to partake in. For all that the area has going for it, there are astonishingly few visitors, perhaps that’s better, but for those of you who truly want to go off the grid and rough it like the Mayas once did Cockscomb Basin deserves to be on your bucket list. Usually termed simply as “Honey Camp”, it refers to the lagoon and the surrounding establishments rather than a specific spot. It’s rather secluded to speak of, being situated about 10 miles down a bumpy road out of town. While most of the waterfront is occupied by undeveloped private properties, two places shine through and allow the public access to the lagoon for all the fresh-water fun they’d like. 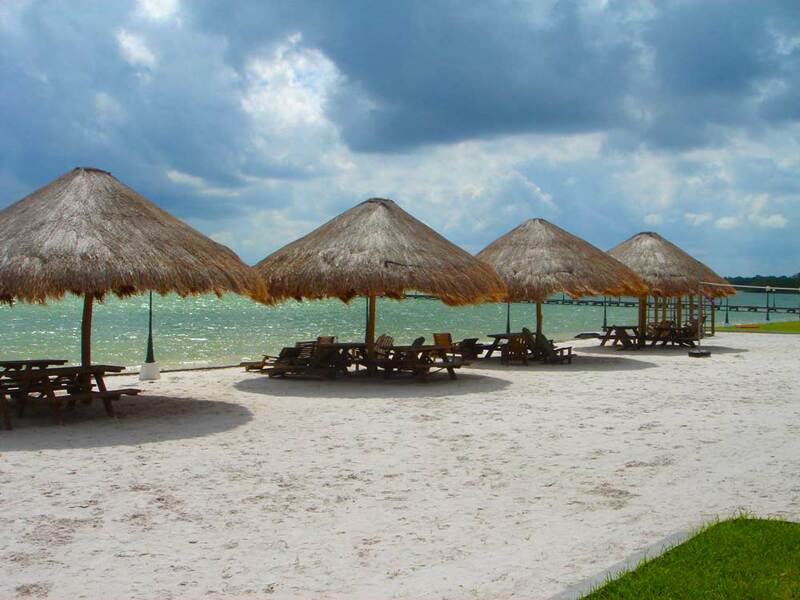 Playa Coral is a small community that’s sprouted up on the northern side of the lagoon and boasts, you guessed it, a palm tree lined, white sandy beach. Honey Camp Beach club is a privately owned estate opposite that, to the south that offers access to their man-made beach, beach-side bar, mini palapas and a dock that extends some 200m out into the lagoon to take advantage of that “sea-like” breeze that’s always blowing. Honey Camp Lagoon is an oddity as it provides all the relaxing beachy feel, with none of the grainy salt and all the privacy in the world, perhaps one of the most underrated Belize destinations in the north. No, this is not the “in the middle of the sea” Belize Great Blue Hole, it is another limestone formation that has been completely eclipsed by the shadow of the former, similarly named landmark. St Hermans is nowhere near the sea, it is instead a small cave outlet that has been flooded with spring water. It is situated on the southern highway in the Blue Hole National Park and is a part of the Caves Branch limestone cavern system, it’s accessible by even public transportation (unlike the entries on this list so far) and a small trek into the lush jungle will have you at a very unassuming, yet welcome oasis. The Blue Hole is so aptly named because different hues of clear crystal blue stretch out from the edge and recede into a mesmerizing navy near the cave outlet, and surprisingly enough, even in the hot summer bake, the water is always cool (cold even to locals) to the touch. 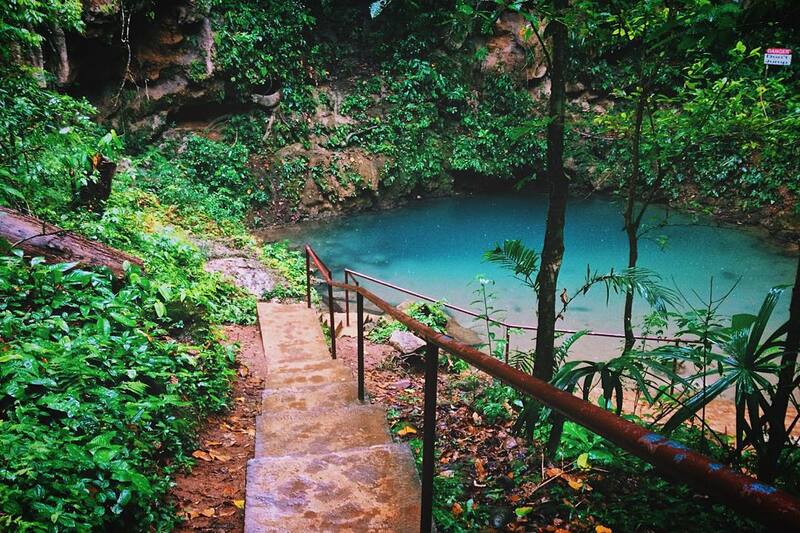 St Hermans Blue Hole has ended up being an underrated Belize destination by way of name, don’t miss this one in the summer. Secret Beach on Ambergris Caye, a few miles north of San Pedro Town, is a hidden gem of the best kind. Calling it a “Beach” is somewhat of a misnomer as there isn’t much sea-side beach to speak of… What is there, however, is a stretch of shallow water that extends about 100 meters into the sea which indeed resembles a submerged beach. Quite in contrast to many of the other beaches on Ambergris Caye this one is on the western side (as if to face inland) and doesn’t suffer from the overgrowth of marine vegetation that the “front side” of the island sometimes has trouble with. What we have there are hundreds of square meters of white sand seabed and warm Caribbean waters. If you’re looking to venture out to this locale, pack your ice boxes with your favorite beverages, and get ready for a bit of a long ride. The trek, however, usually ensures that while populated, Secret Beach is never crowded and always the perfect spot for an evenin’ tan! The Sand bar, not to be confused with Sandbar in San Pedro, is literally what it sounds like, a slightly raised mound of sand (so that means shallow water) that is right in the middle of the sea. This unassuming shallow spot in between St George’s Caye and the Belize Barrier Reef is host to much fun for locals and travelers alike, the (in some parts) wading level waters allow for ice coolers, grills and sometimes even camping chairs to be put in to host a sea party. 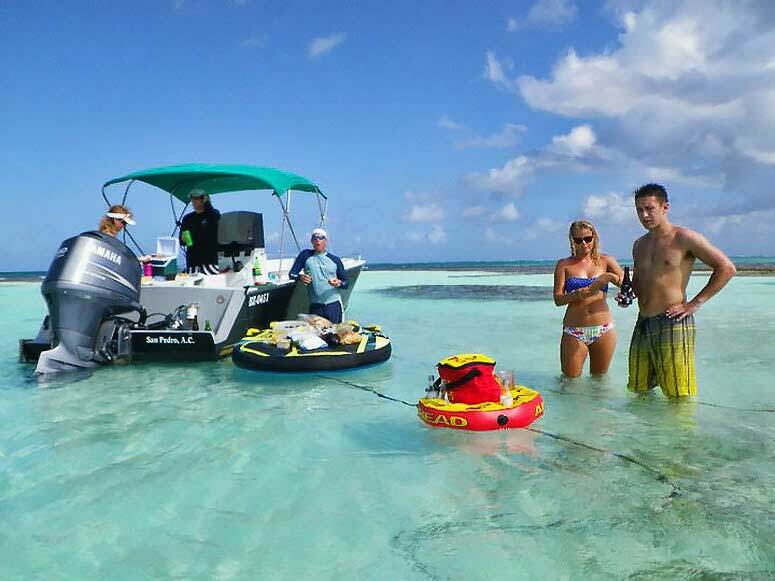 Many tour companies offer stops at this area as rest times between their diving or snorkeling expeditions and allows you to get out of the rocking boat to relax on solid ground, so to speak, for a while, grab a snack and a drink from your provisions before you’re jetting off again to your next adventure! 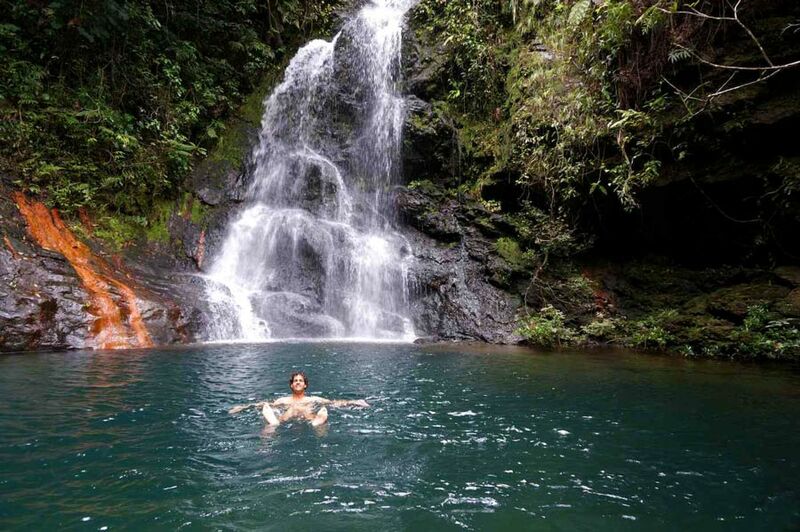 Have you been to any of these Underrated Belize Destinations? Did we miss an attraction you think should get more attention?